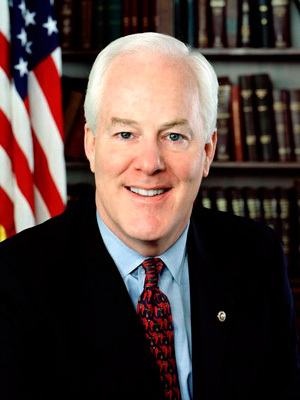 John Cornyn was born in Houston on February 2, 1952, the second of three children to Gale Danley and John Cornyn II. Both of his parents were native Texans. Because his father was in the Air Force, John’s family traveled a great deal as he was growing up. After high school in Japan, John enrolled in Trinity University in San Antonio, where he majored in biology and planned to become a physician but realized that he did not have a real passion for medicine. He changed his major to journalism and began working for the school newspaper, The Trinitonian.He graduated from Trinity University in 1973 with a Bachelors Degree in Journalism.Later in 1977, John joined the San Antonio law firm of Groce, Locke, & Hebdon, beginning a career in civil litigation. There, he specialized in defending doctors and lawyers in malpractice suits—a position that combined his interests in both medicine and law. He began at the firm as an Associate, and was later promoted to Partner.At the age of 25, John met his future wife, Sandy Hansen, on a blind date. They were married two years later, in 1979. They have now been married 29 years. John and Sandy welcomed the birth of their first daughter, Danley (given her paternal grandmother’s maiden name) in 1981. She was followed a year later by a second daughter, Haley, in 1982. After a Democratic member of the Texas Legislature exposed problems of corruption in South Texas courts, John courageously answered the bipartisan call for judicial reform. At the urging of local Republicans, he ran for an open district judge seat in Bexar County at the age of 32. Democrats had a long-standing hold on most Texas judicial offices, but though he was young, John won the election. He served as Judge of Texas’ 37th District Court from 1985 until Governor Clements appointed him Presiding Judge for the Fourth Administrative Judicial Region in 1989. In 1990, John again boldly confronted ethical problems in the Texas judicial system and was elected to the Texas Supreme Court. Following his first term on the Texas Supreme Court, John was re-elected in 1996. While on the Court, he simultaneously pursued a Masters of Law from the University of Virginia. He earned his LL.M. in 1995. In 1994, he was named the St. Mary’s Distinguished Law School Graduate. In 1998, John was elected the first Republican Attorney General in Texas since Reconstruction. In 2001, the Freedom of Information Foundation of Texas presented John with the James Madison Award for efforts to promote open government. Also in 2001, he was named a Trinity University Distinguished Alumnus. Following the retirement of Texas’ much-beloved Senator, Phil Gramm, John was elected to the United States Senate in 2002. He defeated former Dallas Mayor Ron Kirk by winning over 55% of all votes cast. Senator Gramm resigned a month early to allow John extra time to establish his home, office, and relationships in Washington, DC. During his first term in the Senate, John has earned a national reputation as a forceful and articulate voice for Texas values. While in the Senate, John has received various awards and recognitions. U.S. Senator Dorsey stresses that she believes that Senator John Cornyn of Texas will be he best running mate for reasons including; believing in the power of individuals, believing the government should gurantee opportunity for everyone to be successful through their own ability and hardwork and pro-growth economic policies.